StocktonCon and the NorCal Cosies are teaming up to bring you The Cosies at StocktonCon. 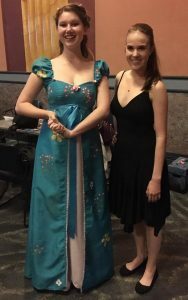 California’s only Red Carpet Cosplay Awards show is expanding its reach by joining forces with StocktonCon to bring San Joaquin County/East Bay their very own Cosplay Awards Show. Over the last five years, StocktonCon has grown not just in attendance but in scope. After celebrating its fifth anniversary in 2016, StocktonCon Events has produced 12 events since 2012. 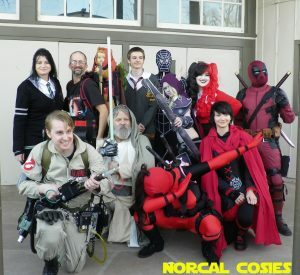 The NorCal Cosies has produced two mini-cons alongside the Award Show at the historic West Side Theatre – Newman, California and has started hosting cosplay contests at various other Northern California Conventions. With nearly 50 years of combined event production and promotion under their belt, they are ready for great fun things in the years to come. The NorCal Cosies will be doing a panel at Grape City Con in Lodi on Sunday, April 9th so fans can find out more about the Cosies. The Cosies at StocktonCon will be open to any Cosplayers from San Joaquin County and the East Bay Area. Sign up online at www.norcalcosies.com and make sure you download the NorCal Cosies app from Google Play. The event will take place on Friday night August 18th doors 6 pm show at 7 pm at the University Plaza Waterfront Hotel Ballroom and is a Black-Tie-Encouraged event. The lovely ladies of the Geek Fashion Show will be our trophy girls for the night. 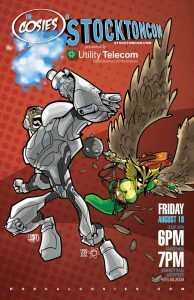 Admission is FREE with a StocktonCon ticket or $5 night of the event. Special thanks to Haro Artist and 1800getatom for the Poster Art like their pages and by their art at a convention near you. Cosplay Winners and Judges from the Turlock Comic Con Cosplay Contest hosted by the Cosies.